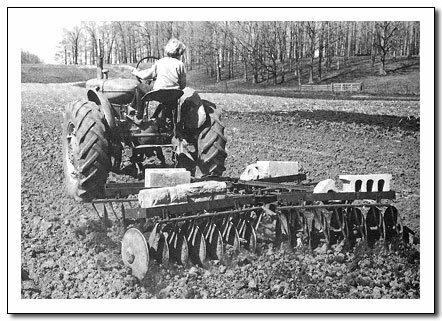 A novice to power farming or gardening is likely to think of a tractor as a machine to pull plows, discs, wagons, and so forth, not appreciating the many other uses it an be put to that greatly increase its value. Most of these capabilities are now being incorporated into garden tractors and even some rotary tillers, and a homeowner aware of the potential versatility of these tractors can save lots of money. Beginning in the 1950s, hydraulic power systems began to appear on farm tractors with the capability of lifting implements mounted to or pulled by the tractor. Refined and combined today with three-point hitch arrangements, tractors of both farm and garden variety handily lift attachments for movement from field to field, or for precise turning and backing into small garden plots. But this ability only begins to show the versatility of hydraulic lift power. 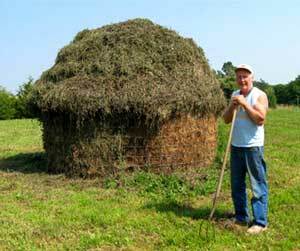 It also makes possible power lifting and lowering of manure scoops and small ‘dozer blades. If you have a farm tractor of from 30 to 50 h.p., made from the ’50s on to the present, there is almost always a manure scoop made to fit it, and for sure a three-point hitch adapted to its drawbar. Check with the dealer who handles your tractor brand. If you have an old Oliver or Minneapolis-Moline (neither is manufactured any longer), talk to a White dealer, the company that bought out these models. If it’s a Massey-Harris, see a Massey-Ferguson dealer. Before buying an old tractor, it is good to check to see if parts are generally available for it. Surprisingly, you can still buy new parts for many tractors thirty years old or more. Air Compressors A four-cylinder tractor can replace an air compressor with the addition of a little-known kit you can by for about $10 at automotive supply stores. You remove one spark plug and insert a fake plug from the kit in its place. This fake plug does nothing but direct air pushed by the piston through it into an air hose attached to it. The hose has a pressure gauge on it. Start the motor and, though it doesn’t run smoothly firing on only three cylinders, it is sufficient for the short lengths of time it takes to pump up tires or pump up the air pressure in a spray tank. Don’t forget that there’s gasoline atomized in the air pumped this way. Spray painting with this air could cause some solvent incompatibilities. Using the PTO Shaft But by far the most useful by-product of a tractor’s lugging power is its power-take-off (PTO) shaft, for which innumerable tools can be powered that otherwise would need their own motors. PTO capability is now built into most garden tractors and even some machines we tend to think of as tillers, especially those made in Europe. The Pasquali two-wheeled garden tractor has some seventy attachments, many of them for the PTO, which will do everything from shear sheep to saw wood. Whether you have an old farm tractor or a new garden tractor, consider this partial listing of PTO-driven tools it can power: mowers, tillers, binders, seed harvesters, saws, hedge trimmers, electric generators, bale conveyers, post-hole diggers, broadcast seeders, lime and fertilizer spreaders, air compressors, sprayers, grinders, gristmills, cement mixers, mulch choppers, power brushes, grindstones, and snowblowers. By using your tractor fully as a power source, you save the cost of all the motors these tools would individually require. A Diet for a Small Motor Experience often proves that the reason for mechanical failure is simply a lack of proper lubrication. Next to keeping a motor clean, the most important maintenance rule is to keep it well fed. While that rule holds true for all engines, it is particularly true of the small, two-cycle engines normally found on lawn and garden tractors, chain saws, and other mechanized tools. These motors do not have separate gasoline and oil tanks; the gas is mixed with the oil to provide both fuel and lubricant. The standard mixture rate is 16 parts regular leaded gas to 1 part two-cycle engine oil. Unless you have specific instructions to the contrary, no other ingredients will do. It is particularly important not to use regular car or four-cycle engine oil in the mix. It will jell the fuel in the heat of operation. The simplest way to get the right ratio of mix without having to measure every time is to use a gallon gas can and buy two-cycle oil in the handy half-pint cans. Fill the gas can half-full of gas, dump in a half-pint of the oil, add the rest of the gas, and you have your 16 to 1 mixture, well mixed. Some manufacturers of two-cycle motors make oil for their machines that require a 32 to 1 ratio or some other formula, although rarely. Follow the maintenance manual that comes with the motor. You can get too particular in my opinion. I read in a popular chain saw book that refineries make a gasoline for summer that will not evaporate so easily and another gasoline for winter that is more volatile. The operator is instructed to use only summer gas in summer and winter gas in cold weather. I’d never heard of such a thing and so far, I can find no service station manager who has, either. In four-cycle engines where oil and gas have their own separate tanks, regular leaded gas is the rule, and for oil, whatever the maintenance manual stipulates. Regular motor oil comes in various weights and classifications. Previously, a lighter oil was used in winter than summer, but the standard usuually used today for summer and winter is an oil designated on the can 10W-30 or 10W-40. Follow the maintenance manual scrupulously. In addition to engine oil, some small tractors and all large ones have transmission gear cases that need to be fed, too. Gear oil is much heavier than engine oil and also comes in various weights—80, 90, and more. Again, follow the maintenance manual. When a motor is new, it is a good time to check over the various oil reservoirs on it to familiarize yourself with the location of filler caps and drains. After the motor is covered with dirt, it is easy to forget to check oil levels in transmissions. Tiller and mower attachments on gear-driven tractors have their own transmission gear cases that must be kept adequately filled. Bearings on tools are usually kept lubricated with grease. To grease them, locate the little metal grease fittings, slip the head of a grease gun over them, and pump. Usually a pump or two is sufficient, and it should be done on a regular basis. Some bearings nowadays are packed with grease at the factory and don’t have fittings. Some of these are sealed and need no more attention; others need to be repacked occasionally. Even in reading the manual, you might overlook such a detail. I did. Use That Used Oil! Not only engines, transmissions, and bearings need the protection of lubrication. Wherever two pieces of metal rub against each other, oil will make operation tremendously smooth and easy. Keep a squirt oilcan handy and filled with the used oil left over from an oil change. Squirt it on drive chains (but use regular chain saw chain oil on saw chains) and on adjusting levers operated by hand. Occasionally I clean the inside bottom edge of my car body where the panels are more prone to rust and squirt on a coat of used oil. Many other tools will benefit from a regular coating of used oil. My neighbor keeps a bucket of used oil handy by his toolshed. 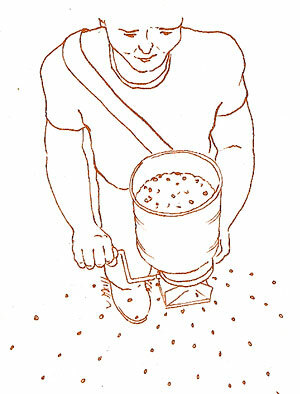 When he puts away a hoe, shovel, scythe, or any other such tool, he first dips it in the oil after cleaning off the dirt. Bare metal will otherwise rust quite quickly, making it much harder to work in soil. Cover sickle bar mower blades with used oil, too. I keep an old paintbrush in the bucket and slap a film of oil over guards, knife sections, and bar at the end of the mowing season. Otherwise these metal parts, shiny from dragging through the grass, will quickly rust. Garden cultivators and discs should be covered with oil for the same reason. Above all, the shiny moldboard of the plow should be kept either coated with grease or used oil between uses. Don’t forget the back side of the plow point and the coulter ahead of the plow point. A rusty moldboard will not plow well and is much harder to pull than a shiny one. I have read the whole book already, and I used the black used oil in the manner described to finish cleaning tools before storage, but I don’t anymore: Used oil is actually oil that has been burnt many times at extremely high temperatures, full of heavy metals, and is one of the most carcinogenic substance on Earth. I think this oil should be recycled at the car dealership rather than finding its way into the soil, even if there’s only a thin film of it after you wiped the tools. Just manipulating it is very dangerous, as it penetrates the skin into the bloodstream. This is probably one of the bottom edit paragraph that should be added to this chapter, since these findings on used oil are more recent than the original Contrary Farmer book, which is my favorite book about sustainable farming by far. I agree with Jan, loaders are most useful in extracting oneself from mud. My vote for best cheap tractor for general small acerage farming is a MF 135 or for a little more power JD 1830 or in the US JD 2030. We Canadians got the one built in Germany, yours was built in Iowa. One mention you didn’t make of a front loader is a substitute for four-wheel drive when you get stuck! I drove into a seep and buried my little Ford 1700 nearly to the axle. I *almost* made the mistake of taking the bucket off, believing a lighter tractor might somehow magically escape the tar pit. But then I thought a little (dangerous, that!) and turned the bucket all the way down before lowering it hard, then turned the bucket up, pushing myself backward, with a little help from the main wheels. After a few such motions, I was free of the ruts, and drove away.